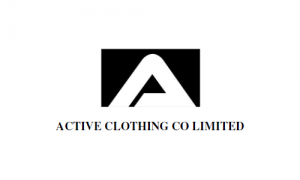 Business description - Active Clothing is an integrated apparel manufacturer with comprehensive capability to design and manufacture high quality readymade garments at competitive prices. The company produces various kinds of garments in various styles across three categories which include flat knit sweaters, outwear jackets, circular knit t-shirts, sweatshirts, joggers for both men, women, kids and babywear. The company has an annual total capacity 12,58,810 pieces of sweaters, 242,190 pieces of jackets and 7,80,000 T -Shirts and Sweatshirts. The total production area in the company is 230,000 sq. ft. For producing high quality products, the company is supported by sophisticated technology and framework. The company’s key customer base of includes Levi Strauss (India) Pvt. Ltd., U.S Polo, Arrow, Izod, United Colours of Benetton, Numero Uno, Basics, Aero staple, Elle, Iconic, Pepe Jeans, Impulse buying house among others. The Company is also a distributor for international brands such as Levis, Celios, Arvind owned licensee brands Ed Hardy, Flying Machine. Active Clothing IPO allotment status is now available on Bigshare Services' website. Click on this link to get allotment status.